Holding the title of “Best of California” for five consecutive years and having more than 100 awards under its belt, Red Hawk Casino is one of California’s hottest gambling spots. The Red Hawk Casino is run and operated by the Shingle Springs Band of Miwok Indians from Eldorado Country and is attached to a number of amenities, including five restaurants and a health and wellness center that’s open to anyone. Although not a complete entertainment complex, Red Hawk has been drawing in players due to its suitable location that offers enough privacy in only a 40 minute drive from Sacramento. Red Hawk Casino is an open, Native American-themed 90,000 square feet floor where you can find solid table and slot machine variety. Most of its floor is normally reserved for slots, of which there are over 2,000 according to official stats, but there are also 75 table games at the main pit. The casino also has a private poker room with 7 tables and can accommodate individual requests. Red Hawk has a few double deck games where the dealer hits on 17. Doubling down is allowed at the games, but only on 9-11s, and you can also double after a split. These tables don’t allow re-splitting aces and have minimums set at $15-25, while the max bet is capped at $500-1000. There are also high-limit double deck tables that accept $100 – $3,000 bets, with the casino open for exceptions. 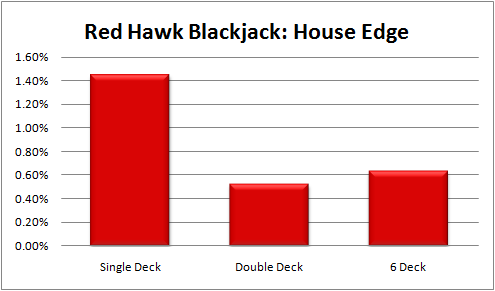 The double deck tables at the Red Hawk have good penetration that ranges from 60-75%, depending on the dealer, which is one reason why these games are regularly frequented by outsiders. Red Hawk offers 6 deck shoe games where the dealer hits on soft 17 and you can double down on any two cards and double after splitting. However, no re-splitting aces is allowed and there’s no surrender option at the shoe games. The table minimums here are set at $10-25 while the max goes to $500. The penetration varies from one dealer to the next. Just like in most casinos nowadays, the single deck payouts were changed to 6:5 and as such these games should be avoided at all costs. The rules at the single deck games have the dealer hit on soft 17 and doubling after splitting is allowed. However, there’s no re-splitting aces and you can only double down on 9-11s, so don’t even think about it. If you keep a low profile, the heat is minimal at Red Hawk Casino, although there have been some reports of pit bosses being aggressive. The best tables to do it would be the double deck games where there’s good penetration. But if you have a partner, you can also hit the 6 deck tables, where they have better rules. The single deck games should be kept away from, regardless of the scenario. 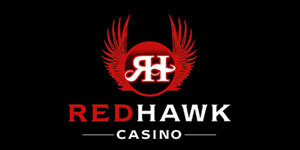 There’s a reason why Red Hawk has been earning a number of accolades throughout the past years. While it’s not the flashiest of places, there’s good value to be found at the tables and the betting limits allow for more flexibility. In short, it’s solid place if you want a change of scene and less heat than most Vegas casinos, or even the recreational weekend game. The double deck blackjack offered at Red Hawk Casino is the best opportunity for counting cards as a solo act. If you have a partner or two and use a team card counting strategy, then you would want to take advantage of longer lasting counts on the 6-deck games. Heat is very minimal judging off of my personal experience playing blackjack at Red Hawk, although I’ve only been there a couple of times.